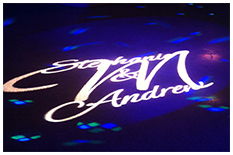 We can create an awesome atmosphere for your wedding with up lighting, monogram gobo projection, bliss ceiling lighting, and dance lighting. Choose from 512 colors to project on walls, arches, columns, doorways, etc. 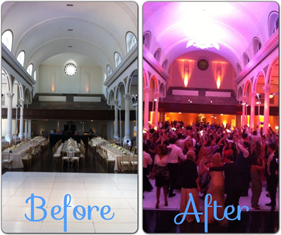 Up-Lights are a great way to add a ton of color to your reception and a great way to make all your photos look amazing. 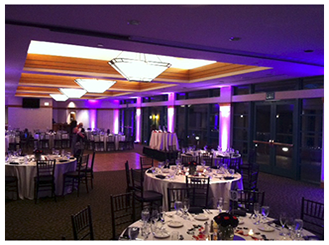 From subtle and elegant to colorful and dramatic, up lights are a “must have” for most couples. 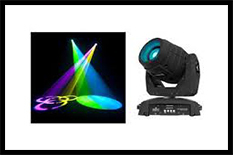 High tech moving head dance lighting is the only way to go. 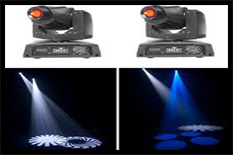 This is what all the clubs are installing and this will make a HUGE difference on the dance floor. 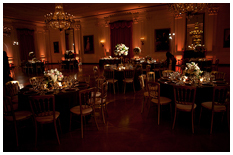 Another advantage to this type of lighting is that there are no dots of color on your guests in photos. A super classy effect. 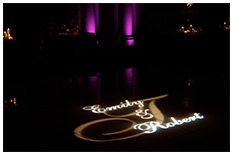 We will custom design the perfect monogram with you to project on any wall or dance floor. These are beautiful! Or, you can have us project any other type of image such as the logo of your favorite Sport’s team. 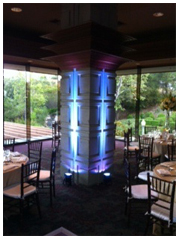 Our newest type of lighting. 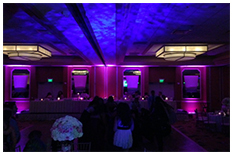 Cover the ceiling with this purple nebula night sky effect with green or blue stars!